Combine and grain carts lined up in a field east of Albion. With soybean harvest winding down, most Boone County area farmers were moving on to corn harvest this week. 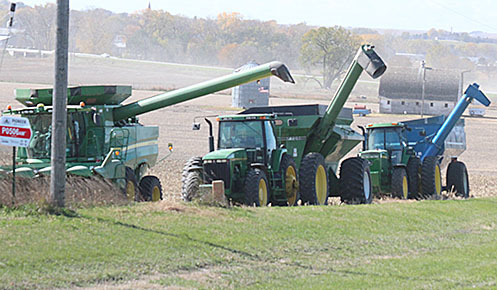 Soybean harvest was estimated at 95 percent complete in the area as of Monday afternoon, while corn harvest was estimated at 20 to 25 percent finished. On Monday, strong winds with gusts of 40 to 45 miles per hour were making harvest conditions difficult and causing some cornstalk breakage and lodging due to stalk rot. The wind was also drying down corn, which had a high moisture content through last week. The area has received only minimal rainfall since mid-October. One agronomist said irrigated corn moisture content was 22 to 25 percent and dryland was as low as 17 to 18 percent in some fields Monday afternoon. Corn yields were mostly averaging 140 to 160 bushels per acre dryland and 220 to 250 bushels per acre irrigated. Read more in the Oct. 25 Albion News and Petersburg Press, print and e-editions.